Plus...$5 off when you book a service appointment online! 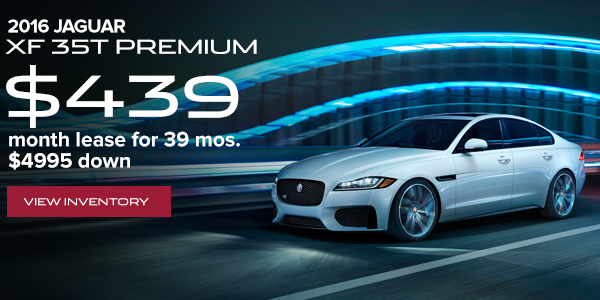 Jaguar XF 35T Premium: Stock GCY11206 MSRP $55282. $4999 Down 39 months 10k miles per year. Lease includes $1000 Bonus Cash. $4999 includes first payment, $795 Acquisition fee, $159 Documentation fee, SC tax of $300 and $39 tag fee. Non SC residents are responsible for applicable tax and tag fees. Lease based on Tier 1 Credit. No security deposit. 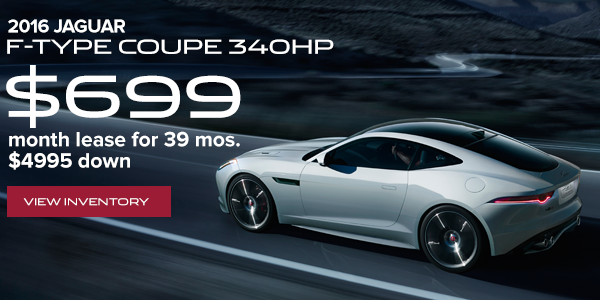 Jaguar F-Type Coupe 340HP: Stock G8K33398 MSRP $72483. $4999 Down 39 months 7500 miles per year. Lease includes $1000 Bonus Cash. $4999 includes first payment, $795 Acquisition fee, $159 Documentation fee, SC tax of $300 and $39 tag fee. Non SC residents are responsible for applicable tax and tag fees. Lease based on Tier 1 Credit. No security deposit. Offer Expires 1/31/2016.